Albert Dorne was born and grew up on the Lower East Side of New York, and had to leave school in the eighth grade to go to work. In 1963, he fittingly received the Horatio Alger Award for Achievement from the American Schools and Colleges Association, Inc. Through a combination of natural ability and strong drive, Dorne progressed successively from being an unpaid assistant to a commercial artist to one of New York’s most successful advertising artists, while still in his early twenties. 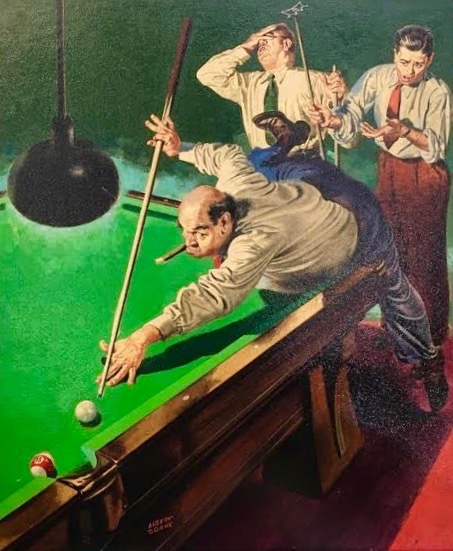 He went on to become a leading editorial illustrator, was elected president of the Society of Illustrators (1947-48), and in 1948 became the founder-director of the Famous Artists School in Westport, Connecticut. These remarkably successful correspondence schools sprang originally from Dorne’s interest in helping aspiring artists who continually came to him for advice. Among his achievements, Dorne highly ranked his being co-founder of the Code of Ethics and Fair Practices of the Profession of Commercial Art and Illustration. In 1953, he was awarded the first Gold Medal for a “distinguished career” by the New York Art Directors Club. Adelphi College conferred on him an honorary Doctor of Fine Arts degree in 1958.